More than 300 participants attended the third and largest edition of the European Labour Mobility Congress. It was attended by outstanding personalities: Marianne Thyssen – European Commissioner for Employment, Social Affairs, Skills and Labour Mobility, prof. adv. Maciej Szpunar – Advocate General at the Court of Justice of the European Union, and Władyslaw Kosiniak- Kamysz, Ph.D. – Minister of Labour and Social Policy. 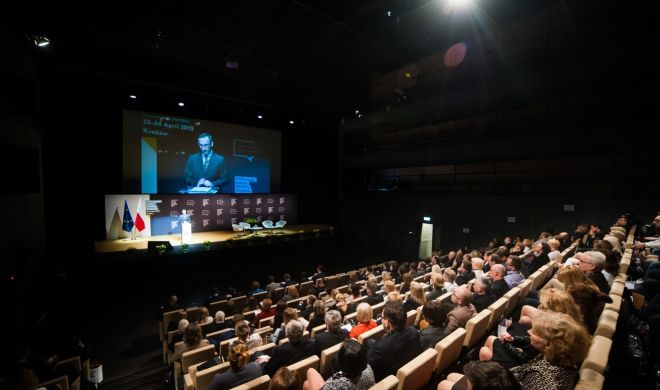 The entrepreneurs, politicians, officials and scientists gathered on 23 and 24 April in the ICE Krakow Congress Centre were looking to find the balance between EU key foundations: the protection of workers and the freedom to provide services. Minister Kosiniak-Kamysz clearly stressed in his address that we should not juxtapose these values against each other, because they are two sides of the same coin. – Free movement of workers, freedom of enterprise and freedom to provide services are the foundations of the European Union. We are not dealing with a conflict of two fundamental values. These are two sides of the same coin. On the contrary, we cannot talk about mobility without the aspect of respect for workers’ rights – said Minister Kosiniak-Kamysz. In this context, disturbing signals are reaching us from some Member States, imposing new requirements on companies posting workers as well as sanctions for non-compliance. This raises doubts as to whether they are compatible with European Union law. – That’s why the compromise reached by the Directive of 2014, after two years of very difficult negotiation, is very important for the entire European Union – stated the Minister. – One of the objectives of that compromise was precisely to ensure compliance with the rights of employees. The new directive regulates not only the issues of monitoring compliance with regulations and administrative cooperation, but also imposes obligations on Member States in terms of transparency of information about employment conditions and existing requirements. – We do not and will not consent to building new walls in Europe under the banner of protection of workers’ rights and fair competition. I am convinced that mobility is an opportunity for the European Union and not a threat. We just need to know how to seize this opportunity as a united Europe – ended his speech Minister Kosiniak-Kamysz. – We will support the freedom of movement and freedom to provide cross-border services if they are conducted in accordance with the law. Checks should be conducive to honest companies – Marianne Thyssen said in a speech in Krakow, announcing that the current provisions regarding posting will be analysed. – At the end of the year we will decide on any change of the rules. Marek Benio of Labour Mobility Initiative argued that some circles nonchalantly posed an equal sign between the posting of workers and their exploitation. If the balance between the protection of workers and the freedom to provide services will not be retained, then – according to Benio – protectionism will win and competitiveness of the whole EU economy will decrease. The talks were also attended by employers. President of the Labour Mobility Initiatives Stefan Schwarz cited examples of discrimination against Polish companies in foreign markets. He called for clear and understandable European legislation that will protect not the local markets but posted workers and their employers. – In my view, these cases are an argument for the fact that the issue of posting of workers is not a result of a conflict of values, but it is a simple brutal fight for the market in which foreign service providers and their employees are the victim – said Stefan Schwarz in his speech. During the second day, which organisers called the expert’s day, participants attending the Congress discussed the proper interpretation of the provisions of current law. The new formula of the meetings included an analysis of case studies, which corresponded to the most sensitive problems associated with posting, with which companies struggle every day. Solutions to the problems reported earlier by ELMC participants were presented by the speakers on the second day of the Congress, including Beata Krajewska of Legality of Employment Department in the Chief Labour Inspectorate as well as lawyers specialising in the subject of the posting of workers with particular emphasis on social insurance, labour law and German law. Event participants also had the opportunity to take part in practical workshops led by Anna Siwiecka, Head of International Insurance Department at the Polish Social Insurance Institution, which explained among other things, the rules for certifying the A1 forms, crucial for posting of workers. Thanks to the speakers, invited guests, partners and above all – the participants for your active participation in the event! We already know the date of the fourth edition of the European Labour Mobility Congress!